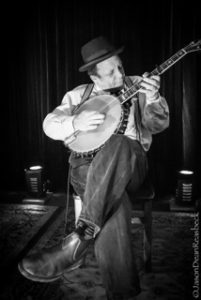 Sam Allison, who performs as Lotus Wight and is a member of Sheesham, Lotus and ‘Son, is known for his soulful singing and inimitable playing of guitar and banjo. Sam’s remarkable live performances always include something unusual whether dropping beats with a jaw-harp, singing an old forgotten chant, or playing a bass harmonica on a chest-rack. He surprises his audience with his ability to move through the American musical cannon with remarkable originality in his delivery and instrumentation and with obvious love for the material and the tradition. Sam is also a member of the international touring act Sheesham, Lotus and ‘Son and has produced recordings for children’s television, animation projects, and with JUNO award winner Jenny Whiteley. He was nominated in 2016 for Best Solo Performance at the Canadian Folk Music Awards, for his CD “Ode to the Banjo”. Sam performed an AlgomaTrad house concert in 2016 and taught at AlgomaTrad Family Camp in 2012 and 2013.